In terms of fundamental physics, the most basic things are the fields and the excitations of the fields. Sometimes the excitations look particle-like, sometimes they look wave-like, rarely both, often neither. I mention this because lately I’ve been getting questions from several directions about “wave/particle duality”. One could make a pretty strong argument that there’s no such thing. The whole approach is a Bad Idea. It’s not good technically, it’s not good pedagogically, it’s just not worth the trouble. The smart approach is to focus on the fields and the excitations in the fields, and not even worry about what’s a particle and what’s not. Additional constructive suggestions can be found in section 3. For starters, duality is a symmetrical relationship. That is, if A is the dual of B, then B is the dual of A. However, even if we restrict attention to classical waves and particles, the relationship is not symmetrical. It is possible to explain classical particles in terms of classical waves: Just construct a wave packet. If the wavelength is tiny compared to the overall size of the packet, you can make the thing behave like a particle. In figure 1, note that the medium – the field – is undisturbed before and after the “particle” passes our window of observation. The converse does not hold. I don’t see any way to convert a classical particle into a classical wave ... not in any way that corresponds to item (1) above. The only way I can see to convert a classical particle to a classical wave is to say that it was a wave all along, which brings us back to item (1). We can draw the diagram. Classical waves encompass classical particles, and not vice versa, as shown in figure 2. We now turn our attention to quantum mechanics, which is where the idea of “wave/particle duality” originated. It seems to me that most of the time, the fundamental fields act like neither a classical particle nor a classical wave. The quantum-mechanical things that don’t look like classical waves don’t look like classical particles, either. 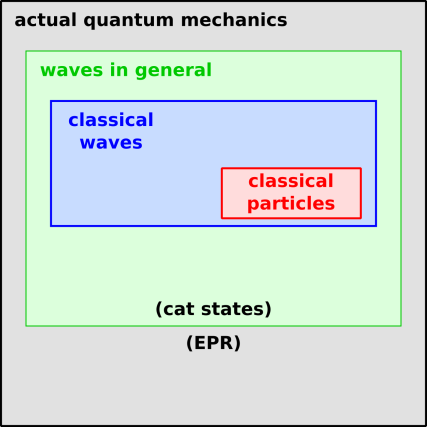 Maybe one could say that “most” of quantum mechanics is just waves, but even then they’re mostly not classical waves. Of course, the correspondence principle still holds, and in the appropriate limits QM can reproduce classical waves and/or classical particles, but this is not the general case. Even the so-called Schrödinger cat states in their simplest form can be explained in terms of waves, as can coherence and decoherence, if you work hard enough. Cat states are beyond the scope of the introductory course, but they are figure-outable if you work hard enough. MEANWHILE.... The whole point of the EPR paper was that typical classical and semi-classical hidden-variable theories do not work. This was brought into ultra- sharp focus by the Bell inequalities. This is what Einstein called “spukhafte Fernwirkung” ... spooky action at a distance. This is not particularly complicated, but it is seriously weird and creepy. (In contrast, cat states are merely tricky and complicated, not creepy.) Theory says the results cannot be explained by anything we would recognize as waves or particles. Good experimental evidence supports the theory. When we examine the pedagogical issues, things get even worse. The proverb says “Learning proceeds from the known to the unknown”. That is relevant here because you can easily explain what you mean by “particle” ... just exhibit a baseball. It’s a reasonably well-behaved classical particle. In contrast, the typical student doesn’t know much about waves, and it will take many hours for them to get up to speed. So the temptation is to try to explain wave/particle duality starting with particles, but this is guaranteed to be a disaster, as discussed in items (1) and (2) in section 1. The whole thing seems to me like the worst sort of straw-man argument. It goes to great lengths to define and teach the idea of particle as distinct from wave, and then bwa-ha-ha, the joke’s on you, there is no such distinction, not even classically, much less quantum mechanically. What’s the point? Why even bring it up? I am aware that historically there were long-running holy wars, arguing over whether light is a wave or a particle. However, just because some historical figure made that mistake doesn’t mean I have to make the same mistake. Focus on the fields, and the excitations of the fields. In the classical limit, sometimes the excitations look particle-like, sometimes they look wave-like, rarely both, often neither. For example, the excitations of the electromagetic field can be called light waves, or rays, or photons, or whatever. Those are just names. The physics is the same, no matter what name(s) you stick on it. Any discussion of the so-called “wave/particle duality” should be deferred. At the very least, they should be deferred until after the student has a good grasp of how waves behave. There is an excellent pedagogical principle that says “ideas before terminology”. Talking about “wave/particle duality” in front of students who don’t understand waves violates this principle bigtime. It’s just a bunch of empty words that will be learned by rote (or not at all). Teach about waves. Trying to do modern physics without waves would be like participating in the Tour de France without a bicycle; you’re not going to get very far. See reference 1 for some suggestions on how to understand and visualize waves. You can explain particles in terms of waves, but do not try to explain waves in terms of particles.